SAN FRANCISCO, CA (October 21, 2015)—The San Francisco Museum of Modern Art (SFMOMA) today announced that a thoroughly transformed SFMOMA will open to the public on Saturday, May 14, 2016, offering nearly three times the previous exhibition space, featuring 260 works from the Fisher Collection, a first showing of more than 600 artworks promised to the museum, the debut of the new Pritzker Center for Photography and an outward-looking architectural design that weaves the museum into the city as never before. 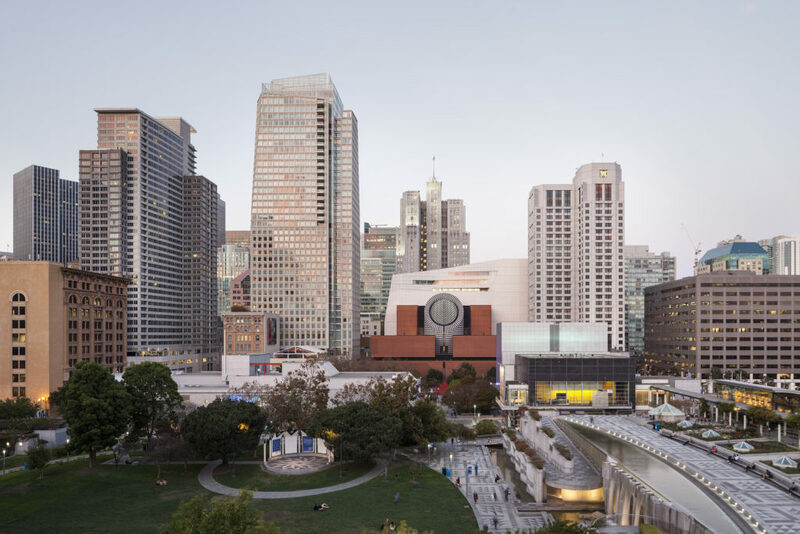 SFMOMA also announced it has reached a capital campaign milestone of $610 million raised which, in addition to covering construction costs, has more than tripled its endowment. Over 500 donors have supported the campaign and fundraising continues for education, art commissioning and exhibition programs at the museum. Other significant benefits of the expansion project include an enhanced presence for performance, made possible by a double-height White Box space; an increase in programs for children and families in the new Koret Education Center; a two-story conservation center adjacent to the galleries; and a global culinary experience in the new restaurant In Situ led by Corey Lee, chef-owner of the Michelin three-star restaurant, Benu. “On May 14th San Francisco will experience the extraordinary scope of the SFMOMA collection for the first time and see firsthand how the newly expanded museum will be able to serve our community, art lovers and school children in exciting ways we’ve only dreamed of doing in the past,” said Charles R. Schwab, Chairman of SFMOMA’s Board of Trustees. SFMOMA’s new website, which launched today and reflects the museum’s new institutional branding, can be found at sfmoma.org. Modern and contemporary art will welcome visitors to the new SFMOMA from every entrance. On the ground floor of the Snøhetta-designed expansion, visitors and passersby will find Richard Serra’s monumental sculpture Sequence (2006) in the free-to-visit, glass-walled Roberts Family Gallery, made possible by Linnea and George Roberts, where Roman steps will provide an inviting space to reflect and gather. On the Third Street side of the museum, a 26-foot-wide mobile, Untitled (1963) by Alexander Calder, will greet visitors in the Evelyn and Walter Haas, Jr. Atrium. The Helen and Charles Schwab Hall is the central meeting place for visitors beneath Sol LeWitt’s joyful Wall Drawing 895: Loopy Doopy (white and blue) (1999). The museum’s presentation on the second floor will feature many beloved touchstone works in the permanent collection galleries, ranging from Henri Matisse’s Femme au chapeau (1905), Frida Kahlo’s Frieda and Diego Rivera (1931), Jackson Pollock’s Guardians of the Secret (1943) and Mark Rothko’s No. 14 (1960). A new second-floor gallery for works on paper will feature promised gifts from the Campaign for Art such as collages and drawings by Eva Hesse, Jess, Ellsworth Kelly and Bruce Nauman. The adjacent galleries for California Art will include paintings and sculptures by figures such as Robert Arneson, Joan Brown, Bruce Conner and Wayne Thiebaud. Two interactive learning galleries provide context for visitors. Just off of Schwab Hall, the Koret Education Center, with a resource library and classrooms, will serve as an educational hub for students, teachers and lifelong learners. On the third floor, the Pritzker Center for Photography, made possible by a generous gift from Lisa and John Pritzker, will offer 15,000 square feet of gallery, study and interpretive space—the largest permanently dedicated to photography in any U.S. art museum. The Pritzker Center for Photography will display works from the museum’s impressive holdings of more than 17,800 works, including photographs of the landscape and culture of the American West, as well as recent promised gifts to the photography department. Galleries dedicated to the Doris and Donald Fisher Collection begin on the third floor with a gallery and adjacent outdoor sculpture terrace devoted to the works of Alexander Calder. In total, SFMOMA will present nearly 260 works from the Fisher Collection by nearly 70 postwar and contemporary artists on view on floors four, five and six. In the special exhibition galleries on the fourth floor, visitors will find promised gifts from the Campaign for Art, including works by Francis Bacon, Vija Celmins, Richard Diebenkorn, Jasper Johns, Jackson Pollock, Ed Ruscha and single galleries devoted to Diane Arbus and Joseph Beuys. This exhibition will also feature promised gifts of architecture and design, including iconic chairs from the past 100 years and original models and plans of experimental architecture. Media arts will be represented by concentrations of works by Lynn Hershman Leeson and Nam June Paik. The Doris and Donald Fisher Collection Galleries on the fourth floor will focus on American abstraction, with major works by Philip Guston, Lee Krasner, Joan Mitchell and Cy Twombly. A contemplative, octagonal-shaped gallery will be devoted to seven works by Agnes Martin, and four galleries will highlight the work of Ellsworth Kelly in a “mini museum” of the artist’s oeuvre. The installation of the Fisher Collection continues on the fifth floor with a focus on Pop art and Minimalism, displaying works by Chuck Close, Sol LeWitt, Roy Lichtenstein and Andy Warhol. Visitors will also find a light-filled indoor sculpture gallery, made possible by Jean and James Douglas, featuring work by British sculptors. The fifth floor bridge to the outdoor Sculpture Terrace will feature a site-specific, commissioned work by Dutch artist Claudy Jongstra—a hanging tapestry using wool dyed from Bay Area geological resources. The Fisher Collection Galleries on the sixth floor will explore postwar German art with monumental works by Georg Baselitz, Anselm Kiefer, Sigmar Polke and Gerhard Richter, as well as photographs by Bernd and Hilla Becher, Andreas Gursky and Thomas Struth. Video installations by international artists William Kentridge and Shirin Neshat will also be presented. The sixth floor will also feature a gallery space dedicated to architecture and design, which will display an opening exhibition of works of graphic design. Finally, the seventh floor will showcase promised gifts of contemporary art including works by Mark Bradford, Jeff Koons, Charles Ray and Cindy Sherman in a loft-like gallery framed by extensive city views from the adjacent outdoor terrace. Visitors will also find galleries dedicated to media arts including works by Beryl Korot and Julia Scher. A two-story conservation lab and artist’s studio complete the seventh floor. Conceived to create an outward-looking and engaging SFMOMA, the design by Snøhetta begins by activating the streets around the original Botta building to create pedestrian pathways, open new entrances and integrate the museum more deeply into the South of Market neighborhood. Two main entrances sit on axis to a major civic corridor running through Yerba Buena Gardens and the Moscone Center in the west and the future Trans Bay Center in the east. By setting the volume of the new building back from the Botta building, Snøhetta has created a new pathway and a glass-walled museum entrance on Howard Street. The eastern façade of the Snøhetta expansion, inspired in part by the waters of the San Francisco Bay, comprises more than 700 uniquely shaped FRP (fiberglass reinforced polymer) panels affixed to a curtain-wall system to create rippling horizontal bands. Silicate crystals from Monterey Bay embedded in the surfaces of the panels catch the changing light and cause the façade to shift in appearance throughout the day. 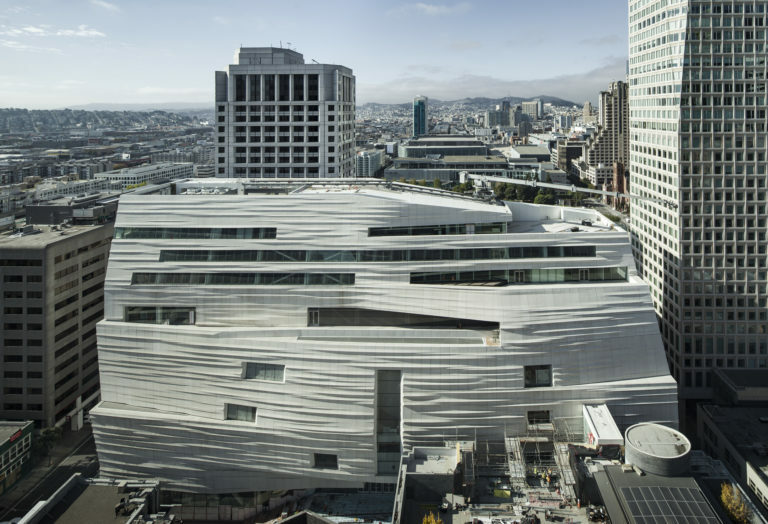 The entrance level to the new SFMOMA will offer exhibition spaces that are free to all. The Third Street entrance space reveals a reinvigorated Evelyn and Walter Haas, Jr. Atrium, under the iconic oculus that is now fully exposed. Snøhetta opened up this space by removing the monumental Botta staircase, allowing the oculus to flood the space with light, and replacing it with a suspended sculptural stair that leads to the main lobby—the Helen and Charles Schwab Hall—on the second floor. SFMOMA has partnered with Meyer Sound to deliver optimal acoustics in the newly renovated Phyllis Wattis Theater, including installation of a Meyer Sound Constellation Acoustic System. On the Howard Street side, visitors can enter through the glass-walled Roberts Family Gallery, entirely transparent to passersby on the street, which is installed with Richard Serra’s monumental sculpture Sequence. A set of maple-faced Roman steps provides an informal public gathering spot and seating area. The spacious Schwab Hall is the place where all of the entrance paths converge and is the hub of the new museum. Here visitors may choose to mingle and enjoy a rotating installation of artworks, or obtain admission to the rest of the museum. Another maple-clad staircase leads visitors to the third floor Pritzker Center for Photography and clerestory windows reveal a portion of the museum’s Living Wall of 16,000 plants, including 24 native plant species, the largest in the Bay Area. The exhibition galleries designed by Snøhetta remain intimate in scale even though the project as a whole is large. They are flexible and column-free, with hidden HVAC, electrical, security and safety infrastructure to eliminate visual clutter. The modular ceiling system diffuses ambient light evenly throughout the galleries. SFMOMA is pleased to acknowledge our new Premier Sponsors, Bank of America and Cadillac. When SFMOMA opens, Premier Sponsors will partner with the museum throughout the year, helping underwrite our art, education and community programs. Bloomberg Philanthropies has generously supported the development of SFMOMA’s new mobile app and is the lead sponsor of the museum’s digital experience. SFMOMA thanks Bank of the West for sponsoring the exhibits in the Photography Interpretive Gallery in the Pritzker Center for Photography.